Electro-polished, surgical grade stainless steel with state-of-the-art needle point geometry that maximizes comfort. Specially coated with a superior grade lubricant to provide a more comfortable injection. Epoxy-bonded for added strangth and comfort. 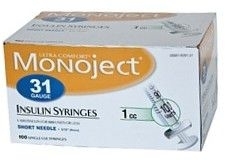 No dead space for more accurate dosage and minimal insulin waste. Precisely printed gradualtions and large bold numbers that are clear and easy to read. Color coded, orange sheath is color matched to U-100 insulin. More information call 1-800-461-7448 M-F 8am-6pm EST to talk to a product specialist.